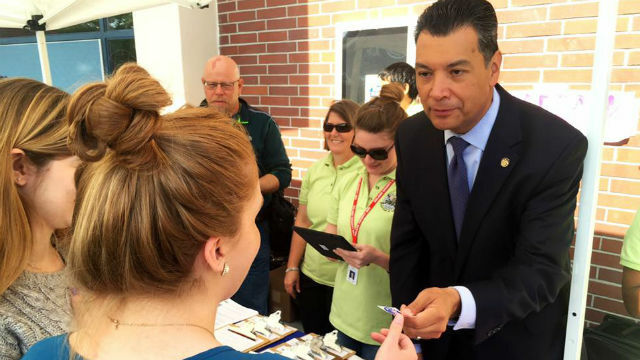 In races for other state offices, incumbent Secretary of State Alex Padilla and Attorney Gen. Xavier Becerra will head to runoffs in November. In the race to succeed Gavin Newsom as lieutenant governor, Democratic businesswoman Eleni Kounalakis was leading the 11-candidate field and will advance to the November general election. Sen. Ed Hernandez, D-Azusa, was running second, but he was being closely challenged for the second spot by Republican businessman Cole Harris. Democrat Padilla, meanwhile, will advance to November as he tries to maintain his job as secretary of state. He will face off with Republican Mark Meuser. State Controller Betty Yee, a Democrat, will take her reelection bid to November, when she will face Republican Konstantinos Roditis. Becerra fended off a challenge from fellow Democrat and state Insurance Commissioner Dave Jones in his reelection bid. Becerra will square off with Republican Steven Bailey in November. Democrat Fiona Ma will vie for the state treasurer job in November, with Repubicans Greg Conlon and Jack Guerrero still competing for the second spot on the ballot. Sen. Ricardo Lara, D-Bell Gardens, will compete in the November race for state insurance commissioner, facing Steve Poizner, who held the job from 2007-2011. Poizner switched his registration from Republican to No Party Preference earlier this year.